I grew up in the piney woods of southeast Texas. Camping was a quick trip into the mosquito-infested woods behind the house. My style has evolved and over the last 4 or 5 years, I have begun to take a lighter weight approach to hiking gear (I still use sleeping bags and tents, just lighter versions). While I have flirted with lightweight hiking, I feel that I am more of a mid-weight hiker now. My philosophy is one of comfort, while carrying the lightest load possible. "This raglan, long sleeved top has a higher neck to trap in heat when you need it. For comfort it has flat sewn seams in the side gusset. You'll be incredibly comfortable with it. And it with you. After 2 weeks of keeping you snug, your BODYFIT still won't hold odor or lose its shape." 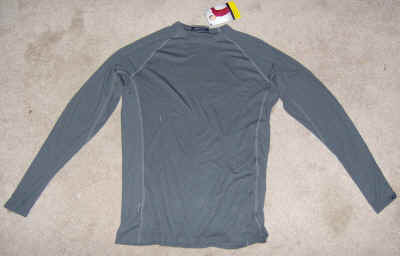 The Icebreaker Skin200 Oasis Crewe is what I would call a light-weight base layer made from Merino wool. It is a pull over, long sleeved shirt with lots of seams. All the seams are nicely sewn and I can't find any loose threads or weakly sewn areas. The sleeves on this shirt are long, just the way I like them. This top is a dark gray in my book, but diesel according to the website. There is an Icebreaker tag sewn into the right hand side of the top, near the bottom hem. The Icebreaker Skin200 Oasis Crewe is a nice looking and soft under-layer. Just from handling it I like the way the fabric feels. Colors available: Black, black/charcoal, diesel, diesel/shingle, molasses/dune, nile/diesel. "Another of our most popular tops. This features a three way collar (zip up, down or up and rolled), thumb loops, a dropped tail and raglan sleeves. It breathes brilliantly and refuses to hold odour. After 2 weeks of keeping you snug, your BODYFIT still won't hold odour or lose its shape." The Icebreaker Skin/Bodyfit 260 Tech Top is what I would call a mid-weight base layer made from Merino wool. There is a zipper (9.5 in/24 cm) that runs from the collar down towards the chest area that makes getting my head into and out of the neck opening very easy. It also has a collar that lies flat on my shoulders when I zip the zipper down and the collar also covers my neck when the zipper is zipped all the way up. The sleeves on this shirt are long, just the way I like them. It appears as if there is no way that these sleeves are going to ride up without me pushing them up. The arms also have thumb holes on the inside of each sleeve. I really like this feature. All the seams are nicely sewn and I can't find any loose threads or weakly sewn areas. The top is two toned, a dark gray and light gray in my book, but diesel and shingle according to the website. The front panel is the lighter color, while the darker color covers the rest of the top, including the arms. There is an embroidered Icebreakers logo over the left breast and an Icebreaker's tag sewn into the seam at the bottom of the right front panel as well. All in all, this is a rather nice looking and stylish top. It really looks good and I am almost scared to test it and despoil it with my stinkiness, but I will do anything in the name of testing. The Icebreaker website had nice pictures and plenty of information, but for some reason I missed the fact that the Icebreaker tops were made of Merino wool. I was expecting a light weight synthetic undershirt to arrive and I was a bit surprised when I opened the box. The Oasis Crewe was made of about the weight of fabric that I had expected and it was also pure wool. The Tech Top was made of heavier fabric than I expected and it was also pure wool. I think most of this was due to my lack of attention on my first visit because I quickly went back to the Icebreaker site and saw that everything (except for the weight of the fabric) was there for my consumption. Here are some questions that I will use to guide my testing and reporting on these two tops. 1. I have requested the Icebreaker tops in a size medium. The size guide suggested going with a smaller size for a tighter fit and a larger size for a looser fit. I am a 38 in (0.97 m) chest, which is technically a size small, but I prefer a looser fit. Was this a wise size choice? Do the tops fit too loosely to layer well? Are they too loose to wear as a stand alone top? 2. How do the various construction methods (raglan sleeves, flat sewn side gussets etc...) affect the comfort? Do the seams rub? 3. Can I wear a base layer under these tops? 4. How comfortable are these tops to sleep in? I tend to sleep in a top in cooler weather. Will they allow me enough freedom of movement at night? 1. D0 these tops allow me a free range of motion? Are they kind of stretchy? Really stretchy? Or not stretchy at all? Will the sleeves ride up my arms as I move around? 2. How well do these tops dry on the trail? This includes soaking from back sweat (joys of wearing a pack) and from trail washing. 3.Are they comfortable to wear as standalone outer layer or do they need to be an under-layer? 4. How do they feel on my body? Merino wool is the listed material and in my mind, wool = itchy. Is it itchy? Is it soft? Just what does the fabric feel like? 5. How do these tops hold up under a pack? Will they be too warm to wear under a pack? Will they pill or wear due to friction? 6. I hate it when undergarments stretch out of shape. Will the Icebreaker tops stretch out of shape or retain their shape after prolonged wearing? 7. How warm are these shirts when in a non-active mode? Can I stand around and stay warm or do I have to layer over them or keep moving to stay warm? 1. Are the elbows and other areas of high wear reinforced? 2. How stain resistant is the Merino wool? 3. Will the fabric pill, snag, or tear from branches or brambles? 4. Icebreaker makes claims about how odor resistant these tops are. How long can I wear them before they develop a trail funk? Will they resist developing a trail smell? 5. Will the trail funk wash out or will it become permanent? 6. What are the washing/care instructions? How difficult are they to follow on the trail? 7. How well does the zipper on the Tech top work? 8. Is the roll up/zip up/roll down collar on the Tech Top comfortable in all positions? These areas range from flat to slightly hilly with little or no real altitude. Most of this area ranges from sea level to about 250 ft (76 m) above sea level. The one unifying feature of all these areas are the piney woods. All of these testing locations were located in heavily forested areas. I have worn both of these tops almost daily for the first month of the field test phase. The weather here in Texas was colder than usual and much colder than I like, but it was great for wearing these two tops. With that little note in place, I also want to point out that despite heavy wear and lots of sweat soaked up by the fabric, these two tops have not developed any permanent odors. I find this rather impressive because on some days the temperatures were over 65 F (18 C) and I was sweating like no man's business. The more I am around the Icebreaker tops the more I am deciding that I like Merino wool. To me, it has all the wonderful capabilities that most of my synthetic garments brag about, but without the devastating body stench that develops whilst in a synthetic top. My original worries about the Merino wool being "prickly" were not completely unfounded. The darker gray fabric of both tops seemed to poke me on many occasions when I put them on. I wondered if this was going to be an on going concern, so after about a week of using both tops, I washed them. I even followed the instructions: 1) cold water wash 2) detergent 3) air dry. I am happy to report that the "prickly" sensation was gone from the Icebreaker Skin 200 Oasis Crewe after washing, but I still get that old fashioned "prickly wool" feeling from the Icebreaker Skin/Bodyfit 260 Tech Top on occasion. The main time I feel the 'prick' is when I have been extremely active and I am very sweaty. I tend to get the sensation only along my back, but it isn't something that I have to deal with every time the top is worn. I have done just about everything I can imagine in this top. The one thing that I have figured out rather quickly is that as a stand alone piece of clothing I much prefer temperatures between 63 to 70 F (17 C to 21 C). Below that the Skin/Bodyfit 200 Oasis Crewe is too thin to keep me warm by itself. What really impressed me about this top was its ability to be used as a base layer. It didn't matter how cold it was outside, if I wore something (fleece vest, fleece jacket, Polarguard parka, tee-shirt, etc.) I got warm very quickly and stayed warm weather I was moving with a pack on or standing around. I have not encountered a base layer that warmed up so fast and kept me as warm. As much as I think this top looks great by itself, I feel that its main strength is as a base layer under another piece of clothing. I will probably beat this to death, but wearing this shirt under something else is wonderful. I have always considered myself a 'synthetic base layer' type of guy because of its properties, but the Icebreaker Skin200 Oasis Crewe matches any other similar synthetic piece feature for feature and comes out way ahead in my mind. Not only is this top warm as an under-layer, but when I was moving quickly and worked up a sweat, it dried quickly as well. If I stopped for a ten or fifteen minute rest along the trail, my back was pretty close to dry by the time I put the pack back on and kept moving. Best of all, I didn't feel cold and clammy when I stopped. The wool stayed warm even while damp from sweat and dried quickly. As I have stated earlier, there wasn't any real odor either. One thing I did discover is that I prefer using the Icebreaker Skin/Bodyfit 200 Oasis Crewe as my sleep top when on the trail. It is quite a bit lighter than the Icebreaker Skin/Bodyfit 260 Tech Top and provided me the right amount of warmth and flexibility while squirming around in my hammock. I wore the Skin/Bodyfit 200 Oasis Crewe under a jacket and did not have to deal with any binding or lack of mobility while sleeping. It was just so warm and toasty as an under-layer and I think that I have found a brand new addition to my permanent cold weather gear list. Since I mainly wore this top as an under-layer, I haven't had the chance to have it snag, tear, or abrade against a pack. There were a some occasions where it was worn alone, but usually in situations that didn't contribute much wear to the fabric. The one thing I would love to see on this top are thumb holes. That would make pulling a shirt or jacket on over this top so much easier, but this is really just a small knock against what I see as a great base layer. If the Skin/Bodyfit 200 Oasis Crewe is the perfect base layer, then this top is pretty close to the perfect outer layer. If I needed a top to wear and stay warm without layering up, the Skin/Bodyfit 260 Tech Top was my choice during the field test phase. I did everything imaginable in this shirt. I even had to bush whack to a geocache that included a healthy dose of Texas brambles and this top came away unscathed. There were no pulls, tears or pilling despite being plucked at, scraped against, and generally abused by the forest and my pack. This shirt has held up to the wear and tear very well despite my best efforts to push its limits. For me, the Skin/Bodyfit 260 Tech Top is too heavy to use as a real base layer. I have layered over it, but I tend towards jackets and vests rather than other shirts. I have also slept in this top several times, but I really prefer the Skin/Bodyfit 200 Oasis Crewe for sleeping. It isn't really a matter of fit, but instead I don't like the zipper and the collar when I am trying to sleep. They don't rub or abrade my skin, but instead I am just strange about not having collars on when trying to sleep. Since I am speaking of the collar, I want to say that it is a feature that I really like about this top. When I am hiking and exerting myself, it is nice to be able to zip the zipper down to help vent and to keep the collar off of my neck. When I stop and start cooling off, it is very convenient to zip the zipper up and cover my neck by zipping the collar all the way up. It really helped keep me warm on rest breaks and also kept me from having to throw on a fleece jacket and zipping its collar up to cover my neck. When hiking and moving I found that the Skin/Bodyfit 260 Tech Top can get very hot in temperatures above 64 F (18 C). Even after I pulled the sleeves up to my elbows and zipped the zipper all the way down, this was one hot and sweaty shirt as the temperatures rose. I never took it off or switched shirts, but I am going to pay much closer attention to the weather reports from now on. I also learned that despite the fact that the back of this shirt can get soaked by sweat when it is warm and I have a pack on, I also discovered that it dries very quickly. I think the Skin/Bodyfit 260 Tech Top is a great shirt. I have really enjoyed wearing on the trail and around camp in the evenings. As with the Skin/Bodyfit 200 Oasis Crewe, it really impressed me when I put a jacket or vest on over it. If it was too cold for just the Skin/Bodyfit 260 Tech Top, I would slip on a jacket or vest and within minutes I was WARM. I really heated up and stayed toasty when I put another layer on over this shirt. If this is the price I have to pay for wearing a wool shirt, then I am more than willing to deal with it. I really enjoy the way both of these tops fit. They are not too tight and they are not too loose. They both drape over my body in just the right way and are extremely comfortable. Even after several washings both tops have retained their fit and softness. There has not been any shrinkage that I have noticed and they are just as soft as ever. After washing both shirts I allowed them to air dry (I always did) and timed the drying process. The Skin/Bodyfit 200 Oasis Crewe was dry enough to wear within about an hour at 63 F (17 C) and the Skin/Bodyfit 260 Tech Top was dry enough to wear within about two hours at 63 F (17 C). This wasn't in direct sun light, so I hope that they would dry even faster when strapped to the outside of a pack. Another thing that has really impressed me about both tops is the lack of odor. I have sweated profusely in both shirts, slept in them, and worn them for days on end with no noticeable odor. Any shirt will smell of its owner after sweating, but airing them out for a couple of hours even seemed to remove any lingering trail stink that built up during the day. One thing that both shirts have in common has to do with wind. On several occasions I have been wearing the shirts with the wind blowing. I noticed that the wind seems to cut right through these shirts. I got cold really fast and had to find another layer to put on over them as quick as I could. Once covered, they did their great job of warming me up quickly, but neither shirt seems to fair very well as a stand alone layer in windy conditions. Not a bad thing, but something I am glad I was able to deal with effectively. I really like both of these tops. They have removed my initial fear about the wear and care of wool clothing. They fit and feel great when I wear them and they wash and dry very quickly and easily. The Skin/Bodyfit 200 Oasis Crewe is a bit too light for me to use it as a stand alone outer layer in cold weather, but it does an incredible job of keeping me warm as a base layer. The Skin/Bodyfit 260 Tech Top is almost the opposite. I find it a bit heavy to wear as a base layer, but it can hold its own without anything over it. In windy or really cold temperatures I think that both shirts need something over them, but then they excel at keeping me warm when I do layer them. Spring came rather early this year and since the temperatures rose rather quickly, I haven't had too many chances to use these two tops during the last two months. I did manage to get in about five more days/nights worth of testing before temperatures here in Texas reached the point where wearing a wool base layer was rather silly. One thing that I did try was layering the two shirts together. I wore them on a dayhike this way when the temperature was about 46 F (8 C). This was a comfortable and warm combo that I wish that I had thought of earlier. These two tops compliment each other and combine to make a really toasty top. The rest of the time I was sleeping in these shirts and didn't layer them. It just wasn't cool enough to warrant any layering. I really liked the cut and drape of these tops. Neither was too tight or too loose on my body. The fit was just perfect and made these shirts comfortable for me to wear as stand alone layers without being embarrassed about exposing myself to ridicule. I never noticed the seams or any of the other sewn locations rubbing or causing friction. The wool on the Skin/Bodyfit 260 Tech Top was a bit prickly in the beginning, but this issue disappeared almost totally after a few washings. Under the Skin/Bodyfit 260 Tech Top I could and did wear different base layers. I much preferred to wear something over it rather than under it, but it was possible to wear a base layer if I needed to. In fact, on of the most comfortable base layers I tried was the Skin/Bodyfit 200 Oasis Crewe. I did not layer under th Skin/Bodyfit 200 Oasis Crewe. It fit a bit more snugly than the Tech Top and I used it as a baselayer/stand alone layer only. I liked sleeping in both of these tops. I preferred the Skin/Bodyfit 200 Oasis Crewe because it is lighter weight, but I did enjoy zipping up the collar on Tech Top while sleeping. The only issue I had with the Tech Top and sleeping was that I didn't like the zipper (I can't explain why) and it was often too heavy to sleep in. Neither one of them was binding or restricted my movement in my sleeping bag. 1. Do these tops allow me a free range of motion? Are they kind of stretchy? Really stretchy? Or not stretchy at all? Will the sleeves ride up my arms as I move around? I have no issues with maintaining my freedom of movement in either of these shirts. I was able to bend, stretch, and otherwise carry out my usual range of motion while wearing the Icebreaker tops. I would classify both of them as being medium stretchy. They give enough to remain comfortable no matter what I was doing with them, but they never stretched out of shape. I also had no issues with the sleeves riding up. On several occasions I had to push the sleeves up to help me cool off, but the cuffs held them in place around my elbows. Both of these shirts dry rather quickly, even when soaked. I often had a wet back from using a pack and the shirts dried rather quickly after the pack was removed. What I did enjoy was despite them being wet, the Icebreakers tops kept me warm. These tops were great as under-layers and great stand alone outer layers. They were comfortable and stylish and I was able to wear them alone on many occasions. Of course I think that they worked even better when layered with another top, they were both stylish enough to be worn out and about. I only had itchy issues with the Skin/Bodyfit 260 Tech Top. Once I washed the top a couple of times, the itchiness rarely reoccurred. I never had any such issues with the Skin/Bodyfit 200 Oasis Crewe. I don't feel that the Icebreaker tops were too warm to wear under a pack, but I always had to deal with a sweaty back when wearing them. This really isn't out of the ordinary for me, but I did like the fact that they kept me warm, even when I stopped and took the pack off. A wet back didn't mean that I was going to get cold in these tops. I also found no signs of wear on the backs of these shirts despite wearing both of them on several occasions directly under a pack. I didn't have any issues with the tops loosing their shape. Since they are not recommended for machine drying, I had expected quite a bit of stretching, but they both held their shapes/size over the course of this test. These tops were pretty warm when I was just standing around, as long as the wind wasn't blowing. They were at their best when I had a layer of clothing on over them, but they held their own in most instances. Neither of the shirts had reinforced elbows or shoulders. I had coffee and food stains wash out easily with both shirts. These were stains that had been present for several days before any cleaning was attempted. This is another good surprise for me. I wore both tops in situations where they were attacked by branches and thorns, but there is no permanent snags, tears, or pilling to be found anywhere on them. I can make anything smell if I wear it long enough on my unwashed body. Both of these tops did a great job of resisting my body funk and even when I did impart some rather interesting odors to them, a simple airing of the shirts tended to remove or reduce this odor till laundering was available. I really liked both shirts because they had such a resistance to picking up and carrying my special essence. I found that I could air it out for temporary results or wash it out in both shirts. They just didn't ever become permanently stinky. The instructions were pretty basic. Cold water wash and hang to dry (no machine/heated drying). This can be done on the trail or in the washing machine. Either way, the shirts can be washed quickly and easily. My wife even mistakenly machine dried the Skin/Bodyfit 200 Oasis Crewe and I feared the worst. When I pulled it out of the drier I was able to put it on and did not notice any shrinkage. I wouldn't recommend this on a regular basis, but I was surprised that it didn't shrink up to doll size or smaller. The zipper worked like charm. It never stuck, snagged, or otherwise caused me grief. Oh boy, did I like the collar on this shirt. I could zip it up to keep my neck warm and keep water out, or I could unzip it to vent and cool myself off. The zipping the neck up and using a cap on my head even allowed me to skip using a hooded jacket to sleep in. I really enjoyed testing these two tops. They changed my impressions of what "wool" was like for hiking clothing. What I really liked about both tops was that they made excellent base layers. No matter what I wore over them, they kept me really warm. As stand alone tops they were both pretty good as well. I think that their real strength is still in being utilized as part of a layering system, but they are stylish and warm enough to wear alone in the right conditions.